Nature’s Sleep is having a promotion! Use the code BEARS50 to get 50% off the entire site as well as free shipping. I am saving up for one of their fabulous mattresses. Hopefully it won’t take too much longer as our mattress is getting old. My son could really use a new mattress too. So, I bring up mattresses cause I think they’re cool and because fatigue is a huge part of my life. Sometimes there are nights and days where I cannot sleep because the pain is overwhelming and/or I am just to wound up. I have tried several types of sleeping medications, and techniques. Sometimes they work, sometimes they don’t. It just so happens that I have all kinds of sleep issues. I have trouble falling asleep. I wake up every morning between 2-4 and have a hard time going back to sleep, and then once I’m asleep after that I don’t want to wake up. In 2006 I was diagnosed with fibromyalgia and the nice doctor’s at the Mayo Clinic told me that the best treatment would be to exercise, and be strict about my sleep. Apparently people with fibromyalgia don’t enter the deep, healing phases of sleep, and so the body is unable to heal from the microtears in the muscles and fibers that occur throughout the day. 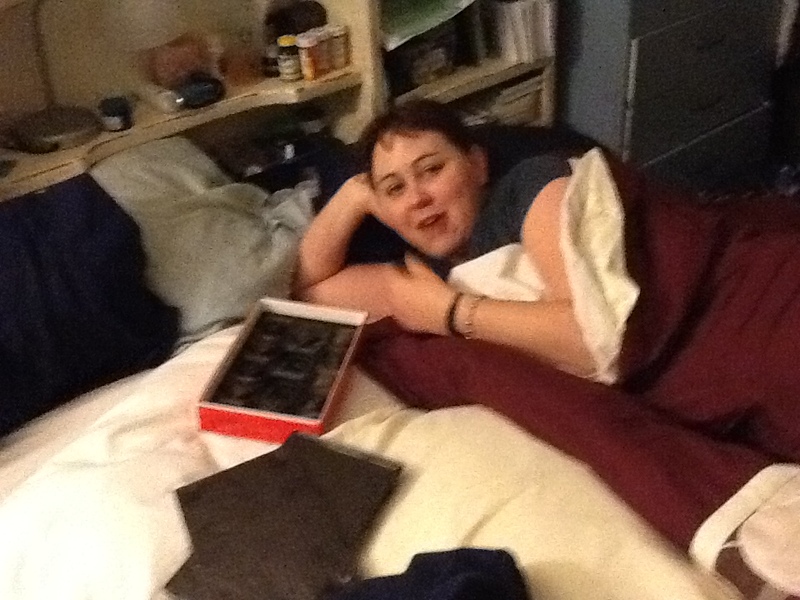 Me in bed, and yes, that’s chocolate! I think I live in this bed – definitely need an upgrade! I wrote a thesis on how interrupting deep sleep in “normal” people will produce symptoms of fibromyalgia, and then correlated the sleep issues to depression in new mom’s. It seems that our bodies must sleep. Mine will eventually collapse and then I sleep for days. During those times, it is difficult to wake me even to eat or shower. When my son was little those were babysitter days, or Grandma days. It was painfully hard to not be able to wake up enough to care for my own child, and is still something that I deeply regret and feel a lot of anger about. I feel like I lose days. They’re just gone and there isn’t anything I can do to stop it, or change it. Now that he is older and in school I can usually manage to sleep while they are gone and be awake in the few hours between school and bedtime, but even that has been a challenge in the past couple of years. Mostly my husband takes care of everything, and he is an angel about it, but it is hard and stressful for both of us. My son has learned to come and lay by me and talk to me about his day, and we’ll play imaginary games, or discuss books and things. His Asperger’s makes it a little difficult because he perseverates, or gets stuck on one topic, and that can make conversations difficult. I love that he still tries though. He still wants to spend time with mom, even though she’s sick and sleepy, and often times grumpy. 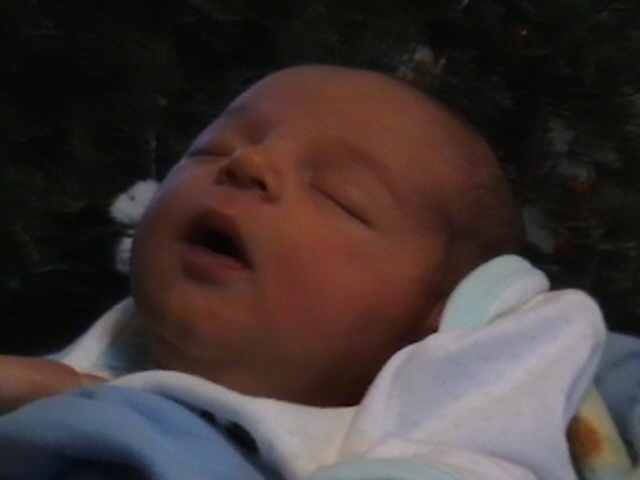 He was so cute when he was little. . .
Last week I broke down. I had bronchitis, and I just couldn’t handle another Pokemon discussion. I got angry and made him leave, and immediately felt extreme guilt because I have been sicker than normal lately and not around as much. He just wanted to talk to his mom and there I was too impatient to listen. I started bawling and told him I was a terrible mom and he would be better off living with his Grandma. Not my best parenting day, or a good day all around. He was super sweet, and just patted my back and told me it would be okay. We had a long discussion in therapy that he isn’t in charge of making me happy, and that he doesn’t make me sad, it is just something that I have to deal with. I made him sad and that hurt. My sister has a chronic illness and has had to deal with fatigue as well. While we were discussing it, we realized there were multiple kinds. I experience the sleep till you are better kind where nothing can wake me. We both experience the flu-like kind too where holding your own head up becomes a burden. You aren’t sleepy, but your body is so heavy and icky that all you can do is sit there and survive. We both play imaginary games with our kids and have very verbal kids since mommy isn’t able to do a lot of active types of play. We also both have made an effort to balance those days with days where mom plays with and spends direct time with the kids. It has been really hard for me having a child with ADHD and Asperger’s as he is always moving and going and wants to be held, and wrestled and touched and moving. I just can’t keep up. It’s a good thing he has an active dad who can give that stimulus. We need to put him in sports, but finances don’t let that, and we need to exercise and get out more as a family, but with the health issues and time issues we are struggling. I would do anything for him, but I can’t afford the things he really needs, and fighting the system takes energy that I just don’t have most of the time. I dream of better mattresses and better sleep, and I work to have good sleep hygiene and to get enough at night so I can up and about during the day, but the truth is my normal isn’t normal. I will always need more sleep at awkward times, and it will always be something that my son will have to work to understand. 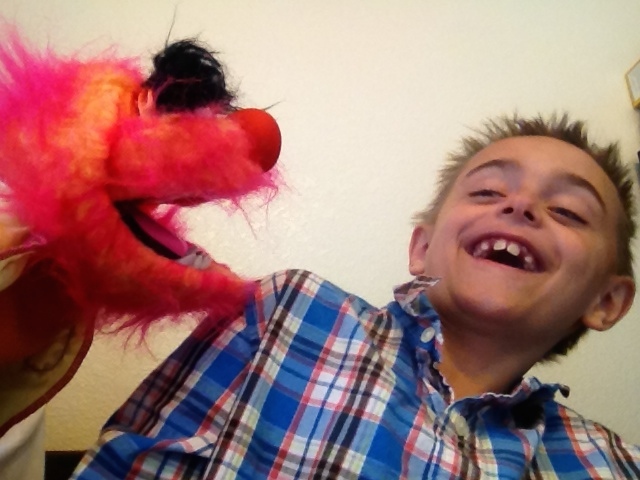 Empathy doesn’t come to him naturally, but he’s learned a lot from my illness, as I have learned from his disabilities. He thinks different, and acts different from I ever expected, but I love him all the more for it. It makes our life infinitely more difficult than if he were “typical”, however, I wouldn’t trade his quirks. I might like a conversation that flowed from topic to topic, but I’m sure he’ll figure that out sometime, and in many ways his ADHD and Asperger’s have kept me moving as his parent, and made me work harder to find answers to my problems and not just settle. He is a major reason to live, and not just in the sense of surviving, but to get up everyday and find joy in the day, and to make it fun and enjoyable for him and dear hubby. Without his constant need I might have been able to slack more, and I would feel a lot less needed. Turn off all electronics an hour before that bedtime. If you can’t fall asleep after 15 minutes, get up and do something calm and quiet until you are ready to try again. Get up at the same time, even if you didn’t sleep. Try not to nap more than 30 minutes. Replace your mattress every 8-10 years. Use a white noise machine. Don’t become dependent on sleeping medication, although they are useful for setting up a good sleep schedule. exercise earlier in the day. Take a nice bath or shower at night to cut allergens and cool off your body. Keep trying, eventually you’ll sleep. I promise. «When Depression Wins – Warning not Light Reading.